The National Hockey League (NHL) ( ) is an unincorporated not-for-profit association which operates a major professional ice hockey league as a joint venture for its self perpetuating membership of 30 franchised member clubs of which 24 are located in the United States and the other six in Canada. Headquartered in New York City, the NHL is widely considered to be the premier professional ice hockey league in the world, and one of the North American major professional sports leagues. The Stanley Cup, the oldest professional sports trophy in North America, is awarded annually to the league playoff champion at the end of each season. The league was organized in 1917 in Montreal , Quebec , Canada after the suspension of operations of its predecessor organization, the National Hockey Association (NHA), which had been founded in 1909. It started with four teams and, through a series of expansions, contractions, and relocations, the league is now composed of 30 teams active franchises. After a labour dispute that led to the cancellation of the entire 2004–05 season, the league has staged a successful comeback, including revenue and profit growth. In 2009, the NHL enjoyed record-high sponsorships, crowds and television viewers. The NHL draws many highly skilled players from all over the world and currently has players from about 20 different countries. Although Canadians have historically constituted the majority of the players in the NHL, over the past four plus decades the percentages of American and European trained players have increased both because of the NHL's continued expansion from six to thirty clubs since 1967, and the increased availability of highly skilled European players especially from former East Bloc countries. [[List of defunct NHL teams>Defunct teams]] not included. * - One championship pre-dates the Canadiens' entry into the NHL. With the expansion in 1974, the NHL was aligned into 2 conferences. These conferences, the Clarence Campbell (representing the west) and the Prince of Wales (representing the east) each had 2 divisions. The Campbell's divisions were the Lester Patrick and Conn Smythe; while the Wales' divisions were the Jack Adams and James Norris (The Norris and Patrick divisions switched conferences for the 1981-82 season). This changed in 1993 when the NHL was realigned into geographical conferences (East & West), divided into two divisions—three divisions since 1998-99. The Eastern Conference currently consists of the Atlantic, Southeast, and Northeast while the Western is made up of the Central, Northwest, and Pacific. Reasons for realignment include further expansion into the U.S. and efforts to expand the NHL's breadth of audience. After a period of stability in the 1980s, the NHL further expanded with nine new franchises in ten years. The San Jose Sharks entered in 1991; a season later the Ottawa Senators would return to the NHL along with the addition of the Tampa Bay Lightning. In 1993, the league added two additional teams, the Mighty Ducks of Anaheim (now simply known as the Anaheim Ducks) and the Florida Panthers. Next came the Nashville Predators in 1998, the Atlanta Thrashers in 1999, and then the Minnesota Wild and the Columbus Blue Jackets in 2000, bringing the total to 30 teams. There have been three league-wide work stoppages in NHL history, all happening between 1992 and 2005. The first was a strike by the National Hockey League Players Association in April 1992 which lasted for 10 days, but the strike was settled quickly and all affected games were rescheduled. A lockout at the start of the 1994–95 season forced the league to reduce the schedule from 84 games to just 48, with the teams playing only intra-conference games during the reduced season. The resulting collective bargaining agreement was set for renegotiation in 1998 and extended to September 15, 2004. With no new agreement in hand when the existing contract expired on September 15, 2004, league commissioner Gary Bettman announced a lockout of the players union and cessation of operations by the NHL head office. The lockout shut down the league for 310 days, the longest in sports history; the NHL was the first professional sports league to lose an entire season. The league vowed to install what it dubbed "cost certainty" for its teams, but the NHL Players Association countered that the move was little more than a euphemism for a salary cap, which the union initially said it would not accept. A new collective bargaining agreement was ratified in July 2005 with a term of six years with an option of extending the collective bargaining agreement for an additional year at the end of the term, allowing the NHL to resume as of the 2005–06 season. On October 6, 2005, the first post-lockout NHL season took to the ice with 15 games, and consequently all 30 teams. Of those 15 games, 11 were in front of sell-out crowds. The NHL received record attendance in the 2005–06 season. 20,854,169 fans, an average of 16,955 per game, was a 1.2% increase over the previous mark held in the 2001–02 season. Also, the Montreal Canadiens, Calgary Flames, Colorado Avalanche, Minnesota Wild, and the Vancouver Canucks sold out all of their home games; all six Canadian teams played to 98% capacity or better at every home game. 24 of the 30 clubs finished even or ahead of their 2003–04 mark. The Pittsburgh Penguins had the highest increase at 33%, mainly because of 18-year-old first overall draft pick Sidney Crosby. After losing a season to a labour dispute in 2005, attendance figures for League teams have returned to solid ground; but the League's TV audience has not because of ESPN's decision to drop the sport from its schedule. The NHL's current agreement with NBC gives the sport a share of revenue from each game's advertising sales, rather than the usual lump sum paid up front for game rights. The NHL is estimated to earn annual revenue of around $2.27 billion. Each National Hockey League regulation game is an ice hockey game played between two teams and is 60 minutes long. The game is composed of three 20-minute periods with an intermission of either 15½ or 17 minutes (if nationally televised) between periods. Television timeouts are taken at the first stoppage of play after 6, 10, and 14 minutes of elapsed time unless there is a power play or the first stoppage is the result of a goal. In these cases, the timeout will occur at the first stoppage after the penalty expires or the next stoppage after the goal, respectively. A new rule was introduced for the 2007-08 season that if the first stoppage of play is an icing, the TV timeout does not occur. This is to prevent players from getting a break despite not being allowed to change. At the end of the 60-minute regulation time, the team with the most goals wins the game. If a game is tied after regulation time, overtime ensues. During the regular season, overtime is a five-minute, four-player on four-player sudden-death period, in which the first team to score a goal wins the game. Until the 2005–06 season, if no team was able to score in the five-minute overtime, the game ended in a tie. Beginning in the 2005–06 season, if the game is still tied at the end of overtime, the game enters a shootout. Three players for each team in turn take a penalty shot. The team with the most goals during the three-round shootout wins the game. If the game is still tied after the three shootout rounds, the shootout continues but becomes sudden death. Whichever team ultimately wins the shootout is awarded a goal in the game score and thus awarded two points in the standings. The losing team in overtime or shootout is awarded only one. Shootout goals and saves are not tracked in hockey statistics; shootout statistics are tracked separately. Shootouts do not occur during the playoffs. In the playoffs, sudden-death 20-minute five-on-five periods are played until one team scores. While a game could theoretically continue forever, only four games have reached five overtime periods, two have reached six, and none have gone beyond six. There are no television timeouts during playoff overtime periods; the only break is to clean the loose ice at the first stoppage after the period is halfway finished. National Hockey League games are played on an oblong hockey rink, similar to a rectangle with rounded corners, and surrounded by a wall. It measures 25.91 by 60.92 metres (85 by 200 ft) in the NHL, while international standards call for a rink measuring 29–30 metres by 60–61 metres (95.14–98.43 ft by 196.85–200.13 ft). The center line divides the ice in half, and is used to judge icing violations. There are two blue lines that divide the rink roughly into thirds, which divide the ice into two attacking and one neutral zone. Near the end of both ends of the rink, there is a thin red goal line spanning the width of the ice, which is used to judge goal and icing calls. Starting in the 2005–2006 season, after testing in the American Hockey League, a trapezoidal area behind each goal net has been introduced. The goaltender can only play the puck within that area or in front of the goal line; if the goaltender plays the puck behind the goal line and not in the trapezoidal area, a 2 minute minor penalty for delay of game is assessed by the referees. While the National Hockey League follows the general rules of ice hockey, it differs slightly from those used in international games organized by the International Ice Hockey Federation (IIHF) such as the Olympics. Infractions of the rules can lead to either the stoppage of play in the case of offside and icing calls, or a penalty call for more serious infractions. During the 2004–05 lockout, the league changed some of the rules regarding being offside. First, the league removed the "offside pass" or "two-line pass" rule, which required a stoppage in play if a pass originating from inside a team's defending zone was completed on the offensive side of the center line, unless the puck crossed the line before the player. Furthermore, the league reinstated the "tag-up offside" which allows an attacking player a chance to get back onside by returning to the neutral zone. The changes to the offside rule were one of several rule changes intended to increase overall scoring, which had been in decline since the expansion years of the mid-nineties. Another rule difference between the NHL and the IIHF rules concerns how icings are called. In the NHL, a linesman stops play due to icing if a defending player (other than the goaltender) touches the puck before an attacking player is able to, in contrast to the IIHF rules where play is stopped the moment the puck crosses the goal line. As a result of the rule changes following the 2004–05 lockout, when a team is guilty of icing the puck they are not allowed to make a line change before the following faceoff. The NHL and IIHF differ also in penalty rules. The NHL, in addition to the minor and double minor penalties called in IIHF games, calls major penalties which are more dangerous infractions of the rules, such as fighting, and have a duration of five minutes. This is in contrast to the IIHF rule, in which players who fight are ejected from the game. Usually a penalized team cannot replace a player that is penalized on the ice and is thus shorthanded for the duration of the penalty, but if the penalties are coincidental, for example when two players fight, both teams remain at full strength. Also, unlike minor penalties, major penalties must be served to their full completion, regardless of number of goals scored during the power play. The NHL and the NHLPA created a stringent anti-doping policy in the new CBA of September 2005. The policy provides for a 20-game penalty for a first positive test, 60 games for a second positive test, and a third offence resulting in a permanent ban. The National Hockey League originated in 1917 with four teams, and through a sequence of team expansions, reductions, and relocations currently consists of 30 teams, 24 of which are based in the United States and six in Canada. 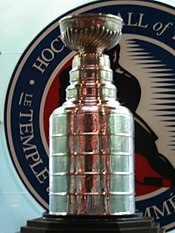 The Montreal Canadiens are the most successful franchise with 24 Stanley Cup championships (23 as an NHL team, 1 as an NHA team); in the four major North American professional sports leagues the Montreal Canadiens are only surpassed in the number of championships by the New York Yankees of Major League Baseball, who have three more. The next most successful franchise is the Toronto Maple Leafs with 13 Stanley Cup championships, but they have not won one since 1967. The Detroit Red Wings, with 11 Stanley Cup championships, are the most successful American franchise. The longest streak of winning the Stanley Cup in consecutive years is five, held by the Montreal Canadiens from 1955–56 to 1959–60; the New York Islanders (1980–1983) and the Montreal Canadiens (1976–1979) have four-year championship streaks. The 1977 edition of the Montreal Canadiens, the second of four straight Stanley Cup champions, was named by ESPN as the second greatest sports team of all-time. Of all the major leagues in North America, the NHL is the only league to field teams that play in two countries' capital cities, Ottawa and Washington, DC . The current league organization divides the teams into two conferences. Each conference has three divisions, and each division has five teams. The current organization has roots in the 1998–99 season where a league realignment added two divisions to bring the total number of divisions to six; the current team alignment began with the 2000–2001 season when the Minnesota Wild and the Columbus Blue Jackets joined the league as expansion teams. The Detroit Red Wings and the Columbus Blue Jackets have the distinction of being the only teams in the Western Conference that are located in the eastern time zone. This results in significantly increased travel time for both teams. There has been speculation during the past few years that the National Hockey League would expand by adding teams in Las Vegas, Kansas City, Missouri and a second team in Toronto . Expansion to Europe has also been rumored. The NHL has been hosting the opening games of the season in Europe for the past 2 years and plans to continue. Nothing further has been announced. The Edmonton Oilers, Hartford Whalers, Quebec Nordiques, and Winnipeg Jets all joined the NHL in 1979 as part of the NHL–WHA merger. The National Hockey League season is divided into an exhibition season (September), a regular season (from the first week in October through early to mid April) and a postseason (the Stanley Cup playoffs). During the regular season, clubs play each other in a predefined schedule. The Stanley Cup playoffs, which goes from April to the beginning of June, is an elimination tournament where two teams play against each other to win a best-of-seven series in order to advance to the next round. The final remaining team is crowned the Stanley Cup champion. Beginning in 2007, the NHL regular season has begun in Europe while teams not involved complete their exhibition schedule. The 2008–2009 season began with the Pittsburgh Penguins facing off against the Ottawa Senators in Stockholm, Sweden and the New York Rangers taking on the Tampa Bay Lightning in Prague, Czech Republic. In the regular season, each team plays 82 games; 41 games at home and 41 on the road. Each team plays 24 games in its division (6 against each divisional opponent), and 40 games against non-divisional intra-conference opponents. That is, 4 games against each team in its conference, but not in its own division. Each team plays every team in the other conference at least once (one game each against 12 teams and two games against the remaining 3 teams). Prior to the 2008-2009 season, teams played 32 games within their division (8 games against each team in the division) and 10 inter-conference games (1 game against each team in two of the three divisions in the opposite conference). The two divisions from the opposite conference which each team plays against were rotated every year, much like interleague play in Major League Baseball. As with the current system, each team played 4 games against the other 10 teams in its conference, but not in its own division. Points are awarded for each game, where two points are awarded for a win, one point for losing in overtime or a shootout, and zero points for a loss in regulation. Among major professional sports leagues, the NHL is the only one to award a team points for losing in overtime. At the end of the regular season, the team that finishes with the most points in each division is crowned the division champion. The league's overall leader is awarded the Presidents' Trophy. The three division champions along with the five other teams in each conference with the next highest number of points, for a total of 8 teams in each conference, qualify for the playoffs. The division winners are seeded one through three (even if a non-division winner has a higher point total), and the next five teams with the best records in the conference are seeded four through eight. The Stanley Cup playoffs is an elimination tournament, where two teams battle to win a best-of-seven series in order to advance to the next round. The first round of the playoffs, or conference quarterfinals, consists of the first seed playing the eighth seed, the second playing the seventh, third playing the sixth, and the fourth playing the fifth. In the second round, or conference semifinals, the NHL re-seeds the teams, with the top remaining conference seed playing against the lowest remaining seed, and the other two remaining conference teams pairing off. In the third round, the conference finals, the two remaining teams in each conference play each other, with the conference champions proceeding to the Stanley Cup Finals. In each round the higher-ranked team is said to be the team with the home-ice advantage. Four of the seven games are played at this team's home venue — the first and second, and, when necessary, the fifth and seventh games — with the other games played at the lower-ranked team's home venue. In the Stanley Cup Finals, the team with the most points during the regular season is given home-ice advantage, regardless of where each team ranks in their own conference. The National Hockey League presents a number of trophies each year. The most prestigious team award is the Stanley Cup, which is awarded to the league champion at the end of the Stanley Cup playoffs. The team that has the most points in the regular season is awarded the Presidents' Trophy. There are also numerous trophies that are awarded to players based on their statistics during the regular season; they include, among others, the Art Ross Trophy for the league scoring champion (goals and assists), the Maurice 'Rocket' Richard Trophy for the goal-scoring leader, and the William M. Jennings Trophy for the goalkeeper(s) for the team with the fewest goals against them. For the 2008–09 season these statistics-based trophies were awarded to Evgeni Malkin of the Pittsburgh Penguins, Alexander Ovechkin of the Washington Capitals, and, dually, Tim Thomas and Manny Fernandez of the Boston Bruins respectively. The other player trophies are voted on by the Professional Hockey Writers' Association or the team general managers. The most prestigious individual award is the Hart Memorial Trophy which is awarded annually to the Most Valuable Player; the voting is conducted by members of the Professional Hockey Writers Association to judge the player who is the most valuable to his team during the regular season. The Vezina Trophy is awarded annually to the person deemed the best goalkeeper as voted on by the general managers of the teams in the NHL. The James Norris Memorial Trophy is awarded annually to the National Hockey League's top defenceman, the Calder Memorial Trophy is awarded annually to the top rookie, and the Lady Byng Memorial Trophy is awarded to the player deemed to combine the highest degree of skill and sportsmanship; all three of these awards are voted on by members of the Professional Hockey Writers Association. One interesting aspect for the trophies in the NHL is that the same trophy is reused every year for each of its awards. The Stanley Cup, much like its CFL counterpart, is unique in this aspect, as opposed to the Vince Lombardi Trophy, Larry O'Brien Trophy, and Commissioner's Trophy, which have new ones made every year for that year's champion. Despite only one trophy being used, the names of the teams winning and the players are engraved every year on the Stanley Cup. The same can also be said for the other trophies reissued every year. Players, coaches, officials, and team builders who have had notable careers are eligible to be voted into the Hockey Hall of Fame . Players cannot enter until three years have passed since their last professional game, the shortest such time period of any major sport. One unique consequence has been Hall of Fame members (specifically, Gordie Howe, Guy Lafleur, and Mario Lemieux) coming out of retirement to play once more. In the past, however, if a player was deemed significant enough, the pending period would be waived; only ten individuals have been honoured in this manner. In 1999, Wayne Gretzky became the last player to have the three-year restriction waived, and after Gretzky's induction, the NHL declared that he would be the last to have the waiting period omitted. The top five point scoring forwards in the 2008–09 season were Evgeni Malkin, Alexander Ovechkin, Sidney Crosby, Pavel Datsyuk and Zach Parise. The top goal scorers were Alexander Ovechkin (56), Jeff Carter (46) and Zach Parise (45). The top four scoring defencemen were Mike Green, Andrei Markov, Nicklas Lidstrom, and Scott Niedermayer. The top goaltenders (by wins) were Miikka Kiprusoff (45), Evgeni Nabokov (41), Cam Ward (39), Henrik Lundqvist (38), Niklas Backstrom (37). In addition to Canadian and American born and trained players, who have historically composed a large majority of NHL rosters, the NHL also draws players from an expanding pool of other nations where organized and professional hockey is played. Since the collapse of the Soviet Bloc, restrictions on the movement of hockey players from this region have lessened and there has been a large influx of European players into the NHL. Many of the league's top players today come from these European countries, including: Ilya Kovalchuk, Pavel Datsyuk, Evgeni Malkin, and reigning MVP Alexander Ovechkin. European players were drafted and signed by NHL teams in an effort to bring in more "skilled offensive players". Although recently there has been a decline in European players as more American players enter the league. The addition of European players changed the style of play in the NHL and European style hockey has been integrated in to the NHL game. Conversely Canadian coaches and the Canadian style of play have been embraced by many European countries. Because of the continued success of Canadian teams in world tournaments many other countries are trying to model their development programs after Hockey Canada's. In Winter Olympic years, the league voluntarily suspends its season so that NHL players can play in the Winter Olympics, representing their native countries (though this practice may after or be modified for the 2010 Winter Olympics, which will be held in an NHL city, Vancouver). Currently the NHL has players from 18 different countries, with the majority (52.0 percent during the 2007–08 NHL season) coming from Canada. The following table shows the origins of every player who played an NHL regular season game in the given year. In Canada, National Hockey League games are aired nationally by the Canadian Broadcasting Corporation (CBC) and The Sports Network (TSN). Regional games are broadcast by a number of networks including Rogers Sportsnet (RSN). French language games are broadcast by the Réseau des sports (RDS) and Réseau Info-Sports (RIS), but no longer on Radio-Canada (the French-language counterpart of the CBC), a change which has caused controversy in French Canada. The program Hockey Night in Canada, usually aired on Saturday nights on CBC, is a long-standing Canadian tradition dating to 1952, and even prior to that on radio since the 1920s. In the United States NHL games are aired nationally by Versus (previously the "Outdoor Life Network" and "OLN"), and by NBC. NBC replaced the previous over-the-air network, ABC, and has a revenue-sharing agreement with the NHL. Versus replaced ESPN as the cable network; Comcast, which owns Versus, offered a two-year $120 million agreement, while ESPN offered a revenue sharing agreement. Versus had about 20 million fewer subscribers than ESPN when the NHL started on Versus, but Comcast switched Versus from a digital tier to basic cable to make NHL games available to more cable subscribers as well as re-branded the network as a sports network. For Versus the NHL coverage was a good addition as Versus' ratings grew by about 275% when it showed an NHL game. Versus has since used its acquisition of NHL rights to approach other leagues for broadcast rights to their sports, the notable success being college football. Owing to a dispute over fees and tier placement, Versus was dropped by the direct broadcast satellite service DirecTV when its contract to carry the service expired on September 1, 2009, cutting access to the exclusive broadcasts of NHL games on Versus to about 14 million DirecTV subscribers in the United States that previously received them. The 2007 Stanley Cup Finals were the lowest rated in the United States in history. As a whole, the television ratings on NBC were down 20% from the 2006 series, with Game 3's coverage on NBC garnering a mere 1.1 rating (approximately 1,205,600 households), making it the lowest rated prime-time broadcast in the network's history. However, coverage in Canada on CBC pulled in 2,608,000, 2,378,000, and 2,553,000 (for Games 1, 2, and 3 respectively), slightly higher than their numbers for the first three games in 2006. Comparatively, in 1994, when the New York Rangers were involved, Game 7 of the Stanley Cup Finals posted a rating of 6.9. Although 2007 saw low Stanley Cup Finals ratings, the 2008 series between Detroit and Pittsburgh drew one of the highest Stanley Cup ratings ever with strong 4.4 as the high overnight rating . XM Satellite Radio is the official satellite radio broadcaster of the NHL, as of July 1, 2007. Between September 2005 and June 2007, the NHL's broadcasting rights were shared with both XM and Sirius Satellite Radio and were broadcast on just Sirius before the NHL lockout. XM used to broadcast more than 80% of NHL games, including all the play-offs and finals. Starting with the 2007–08 season, XM broadcasts every game. Outside of North America, NHL games are broadcast across Europe on ESPN America which takes feeds from Versus, FSN, TSN and CBC (including Hockey Night in Canada), and MSG. Games can also be seen in the UK on Five, on Fox Sports in Australia, on SKY Sport in Italy, on Viasat Sport in Russia and on Viasat Sport in Norway. The NHL is considered one of the four major professional sports leagues in the North America, along with Major League Baseball, the National Football League, and the National Basketball Association. Hockey has the smallest total fan base of the four leagues, the smallest revenue from television, and the least sponsorship. However the league is very prominent in Canada, where hockey is the most popular of these four major sports. While the NHL does not hold one of the largest fan bases in North America, it does hold one of the most affluent fan bases. Studies by the Sports Marketing Group conducted from 1998 to 2004 show that the NHL's fan base is much more affluent than that of the PGA Tour. The NHL estimates that fully half of its fan base roots for teams in outside markets. Beginning in 2008, under the direction of Chief Operating Officer John Collins, the NHL began a shift toward using digital technology to market to fans to capitalize on this. As a result, in 2009 the NHL drew a record number of sponsors and television viewers. The NHL advocates for a number of causes throughout the season. During the days leading up to Remembrance Day (November 11), in respect of the day, coaches and other NHL officials wear red poppy lapel pins. Hockey Fights Cancer is a joint initiative founded in December 1998 by the National Hockey League and the National Hockey League Players' Association to raise money and awareness for hockey's most important fight. It is supported by NHL Member Clubs, NHL Alumni, the NHL Officials' Association, Professional Hockey Trainers and Equipment Managers, corporate marketing partners, broadcast partners and fans.